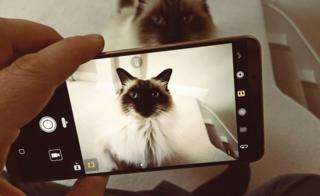 Huawei says it has given its latest smartphones advanced object-recognition capabilities to help them take better photos than the competition. The Chinese company says the artificial intelligence-based technology can even distinguish between cats and dogs in a split-second, allowing it to automatically tweak how their fur and eyes appear. It says this is possible because of a new type of chip in the Mate 10 phones. But experts question the tech's appeal. Huawei is currently the world's third best-selling smartphone maker, according to research company IDC, with a market share of 11.3% in the April-to-June quarter. That put it slightly behind Apple, which had a 12% share. The Shenzhen-based company has previously said it aims to overtake its US rival before the end of 2019, and then eventually leapfrog the market leader, Samsung. Huawei says it trained the Mate 10's camera-controlling algorithms with more than 100 million pictures to teach them to recognise different scenarios and items. To ensure the decisions are taken quickly enough, the company said, it had developed its own processor - the Kirin 970 - which has a neural processing unit (NPU) in addition to the standard central processing unit (CPU) and graphics processing unit (GPU) used to power most computers. The architecture of the NPU is a specialised part of the chip designed to handle matrix multiplications at speed - a type of calculation used by artificial intelligence neural networks, which attempt to mimic the way the brain works. Huawei says the inclusion of an NPU in its chip allows it to recognise about 2,000 images per minute. That is about double the rate that the new A11 processor in the iPhone 8 would be able to handle, Huawei says. The company is not alone in designing a part of its processor to handle AI-enhanced tasks. Apple has introduced what it calls a "bionic neural engine" in the A11, which will be used for facial recognition tasks by the forthcoming iPhone X. And Google has developed what it terms a "tensor processing unit", which it uses in its data centres to support its Search, Street View, Photos and Translate services. One expert suggested Huawei's move was significant but difficult to market to consumers. "All of this could have been done on a GPU," said Ian Cutress, from the Anandtech engineering news site. "But having the NPU makes the processes faster while potentially using less power. "The thing is that it's very difficult to explain all this to potential customers as it gets very technical very quickly. "For now, the use cases are limited and probably not going to be the sole reason to buy the device." Many smartphone cameras make automatic tweaks to the images they take, but Huawei suggests its technology takes this to the next level. "Without doing lots of tests, it's difficult to tell how much value this really adds to the camera capabilities," said Ben Wood, from the technology consultancy CCS Insight. "The problem with any of these techniques is that whether they are of benefit or not is in the eye of the beholder - it's very subjective." Huawei also says the NPU is used to optimise tasks carried out by Microsoft's pre-loaded Translator software, which converts words and images of text between dozens of languages. According to the Chinese company, the software runs about three times faster than it would do otherwise. Will killer bots do away with smartphone apps? The company is now inviting third-party developers to build other apps to take advantage of the NPU. But Mr Wood said that he had concerns that Huawei was putting too much emphasis on the technology. "I don't believe most consumers understand what AI is," said Mr Wood. "So, if Huawei intends to market the new phones around the technology, it will have to clearly articulate what the benefits are beyond it just being the buzzword of the moment."